One, two, three strikes you’re out – or in Kelowna goalie Sam Bobyn’s case, you’re in. 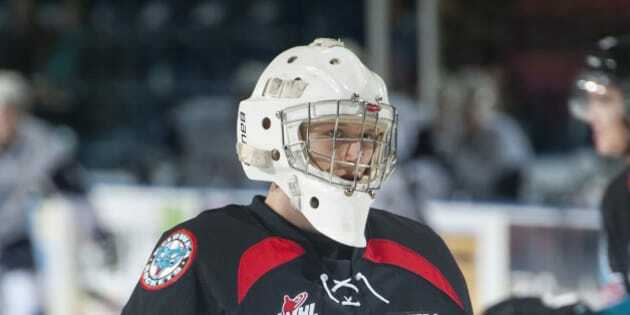 Bobyn, 17, went from a recreational league player to Western Hockey League goaltender literally overnight, thanks to a series of unusual events. Just hours before Wednesday’s major junior game against the Saskatoon Blades, the Kelowna Rockets announced that their top two goalies — Jackson Whistle and Michael Herringer — were injured, leaving the team with Jake Morrissey between the pipes and no one left on the bench. So the Rockets called up Bobyn, who has never played in the WHL, as the emergency backup. No one expected the Grade 12 student who plays rec hockey once a week to actually hit the ice. But in the third period, Morrissey got involved in a rare goalie fight and was booted from the game. Bobyn found himself playing for the best team in the WHL with a 4-1 lead late in the third — with the team eyeing to snap three-game home losing streak. In the end, Bobyn blocked the two shots he faced to seal a 5-1 Rockets’ victory, a feat head coach Dan Lambert and Bobyn both attribute to a great team effort. Lambert says Bobyn may stay on the Rockets’ roster for Friday’s home game against Prince George.